• silicone stamps "Viva Decor"
• stamping colour Paper-Soft-Color" Viva Decor "
• coloured ribbons or thin linen thread; • rubber gloves. Step 1. 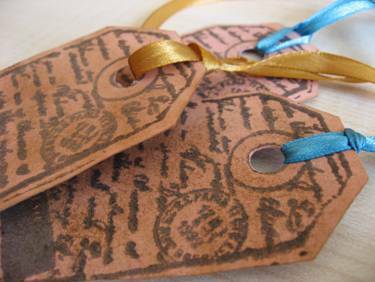 Cut out the labels, cards of the desirable shape and make them "worn" using coffee or coffee grounds. Put an applicator soaked with warm water in the coffee. The more uneven the coffee spots, the more authentic the worn effect will seem. Dry and straighten putting it, for example, under an improvised book press for a day or so for mellowing. Step 2. With the help of an applicator colour the silicone stamps and then stamp the labels or cards. Dry it. Step 3. Cut with small scissors or punch holes with a puncher on one side of the card. Place a coloured ribbon or a linen thread through it. The labels are ready for use! How to felt warm house slippers? Sveiki Inga. Nejausi uzdutos sai lapai meklejot, ka taisit leiblus. Tas ir tiesi, ko mekleju, bet palika neskaidrs, kur tos silikona dizaina gabalus izveidot?